Prep Day Directions: Heat broth in large skillet on medium heat. Add cream cheese, zest and juice; cook and stir 3 to 4 min. or until cream cheese is melted. Cream cheese will take longer if making a large batch to dissolve. Add Parmesan; mix well. Once the cream mixture is cool pour into seal-able bag. Add mozzarella and parsley to another bag. Combine shrimp, cream bag and mozzarella bag into a larger freezer bag. Serve Day Directions: Completely thaw entire packet in refrigerator. Cook noodles separately. Warm Sauce in large Skillet or Dutch oven. Add Shrimp and cook approximately 3-5 minutes until Shrimp is warm. Add noodles and toss entire mixture. Sprinkle each serving with mozzarella and Parsley. May want to add lemon wedges. Prep Day Directions: Mix together all spices in small bowl. Rinse chicken cavity and pat dry with paper towel. Rub each chicken inside out with spice mixture. Place 1 onion into the cavity of each chicken. Place chickens in ziploc freezer bag and refrigerate at least 4-6 hours or freeze. Serve Day Directions: Thaw chicken. Place chicken in a roasting pan and bake uncovered at 250 degrees for 5 hours or until a minimum internal temperature of 180 degrees. Let the chicken stand 10 minutes before carving. Prep Day Directions: Put the chicken thighs in a bag and seal. 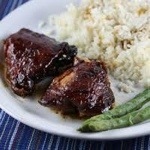 In a small bowl, combine the barbecue sauce, honey, mustard, and Worcestershire sauce. Once mixed, put in a separate bag and freeze. Serve Day Directions: Thaw chicken thighs and sauce. Sprinkle chicken with salt and pepper. Place on a broiler pan. Broil 4-5 inches from the heat for 3-4 minutes on each side or until lightly browned. Transfer to a slow cooker. Pour sauce over chicken; stir to coat. Cover and cook on low for 4-5 hours or until chicken is tender. The chicken can also be baked in a 350 oven for 20 minutes. Prep Day Directions: Place 6 chops, seasoning packet and soup in a ziplock bag and freeze. Serve Day Directions: Thaw and place all ingredients in bag in crock pot and heat on high for 4 hours or low for 6 hours. Enjoy! Prep Day Directions: Bake bacon for 8 to 10 minutes at 400 degrees, then chop Cut cheese sticks into bite size pieces. In a large bowl, mix together the beef, worcestershire, onion soup mix, bread crumbs, black pepper, beef stock, and chopped bacon. Form portions around cheese pieces to make into meatballs. Place in labeled freezer bags. Label jars of marinara sauce and spaghetti packages. 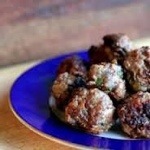 Serve Day Directions: Thaw meatballs. Preheat oven to 400 degrees Arrange meatballs on a sheet pan with a rack and bake until thoroughly browned, about 10 to 15 minutes. Make spaghetti according to package directions. Heat marinara on stovetop. Prep Day Directions: Slice beef against grain in 1/4 to 1/2 inch slices, 2-3 inches long. 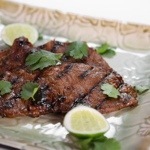 Combine all marinade ingredients. Put beef and marinade together in bag. Freeze. Serve Day Directions: Thaw marinade and steak in bag. Grill, broil or fry strip steak to desired degree of doneness. Enjoy! Prep Day Directions: Add all ingredients to ziplock freezer bag and freeze. Serve Day Directions: Place on baking sheet at 350 until juices run clear. Prep Day Directions: Combine all relish ingredients, mix and bag. Freeze. Mix ground beef and chorizo well, add all other ingredients and combine thoroughly. Form meat into six patties. Bag and freeze. Serve Day Directions: While frozen take cheese and relish out of the bag and thaw all 3 separately. Grill patties and top with pepper jack cheese. Add a spoonful of corn relish (serve cold). Prep Day Directions: Cover tenderloin with spice, coating well. 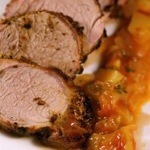 Place Pork Tenderloin in labeled gallon bag with Jerk spice Paste. Combine the Jerk Spice ingredients in a small bowl and mix to form a coarse paste. Or blend in food processor. Coat pork tenderloin and Marinate at least 4 hours or freeze at this point. Serve Day Directions: Thaw. Grill tenderloin, covered, over indirect medium heat for 10 minutes each side. Juices should run clear or temperature 160 degrees. Let roast sit about 10 minutes to let juices settle. Saucy Chicken thighs were a hit at a church function. We liked both meatballs recipes and the sticky chicken. Justin and I loved the greek meatballs with mint! We served ours with sliced cucumbers and diced tomatos and made a tzatziki to spead on the pita! Yum!